Therea��s one wilted flower in a vase in Dr Acharyaa��s dental clinic that is causing her some annoyance; she refers back to it at least three times during our chat. Ita��s a niggle at the back of her mind that she cana��t get rid of till it is fixed. It actually summarises her ideas on style perfectly a�� in her mind, it is about being neat, ordered and, therefore, clearer in thought and action. Looking and feeling a�?nicea�? is to her a simple by-product of this. 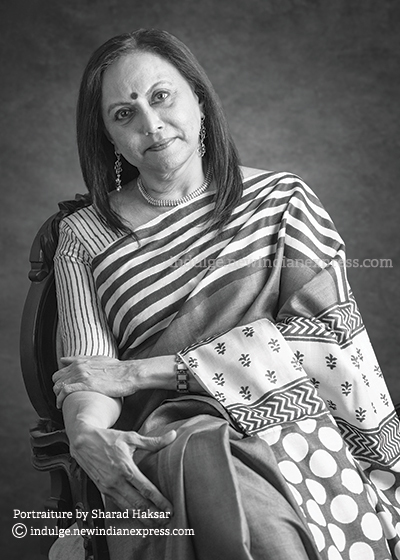 As a young girl, transplanted from Mangalore to Bombay, her eyes were opened to different ways of doing things a�� from the way people looked to the way they lived in a metropolis. She frankly admits to always wanting to look nice, making an effort to do so, not for anyone but for herself. Therea��s a hunger for learning and a sense of competitiveness a�� during our portrait shoot, she tells me later, she wondered about learning photography. Her love of music has her in an online singing program. Ask why, and she says that she intends to sound better in the bathrooma�� as flippant as that may sound, the underlying rationale is clear. a�?Ita��s all about me and my personal challenges. Ita��s not about proving anything to anybody else.a�? Interestingly, she also talks about her sense of style as a balance to her fear of losing her femininity. As an entrepreneur, having to take hardline calls on situations, she feels that looking a certain way helps remind her of this. It is a bold admission, but one Ia��ve heard from many women. We talk about the pervasion of media fuelled vanity-based cosmetic surgery a�� in her case aesthetic dental surgery a�� and she answers with candour. a�?Doctors rely on you to get yourself proper on the insidea�� what is outside is directly related to the amount of money you have a�� the amount of money you are willing to spend on what you think is wrong with you.a�? She is referring to the barrage of white media noise we are subjected to, and the unrealistic expectations placed on outward appearance. True enough, mention the word a�?stylea�? and we gravitate to its most superficial, yet easiest identifiers a�� fashion and grooming. Many years back, when I used to design for her, she tried on a hand embroidered kalamkari achkan, a piece I made for her. Straight out of the trial room, a quick glance in the mirror, and she announced, a�?I look like a toothpaste tube in this.a�? That was all. And back to drawing board it went. This was a teaser, Venkat can trouble you for more insight on what this by line is all about.